Introduction: Conventional real-time PCR for the detection of bacteria is unable to distinguish between viable and non-viable cells within a sample. Propidium monoazide (PMA) is a photo-reactive dye that is cell membrane impermeable which interacts with non-viable cells ceasing amplification due to DNA modification. We investigated if PMA could distinguish between viable and non-viable Haemophilus influenzae. Methods: H.influenzae strain (NCTC11931) was grown in LB broth for 24hrs then subjected to 90°c heat. Half were treated with PMA and incubated in darkness for 5min, then subjected to an intense light source for 15min. Bacterial DNA was extracted from all samples, using a commercial assay and quantified using real time-PCR. Each sample was plated on a chocolate agar plate and incubated for 24hrs. Results: PMA treated and non-PMA treated samples not subjected to heat treatment had very similar values, geometric mean (95%CI) of 5.22 x 107(4.05to 6.74 x 107) and 6.29 x 107 (5.09 to 7.78 x 107) gene copies respectively. 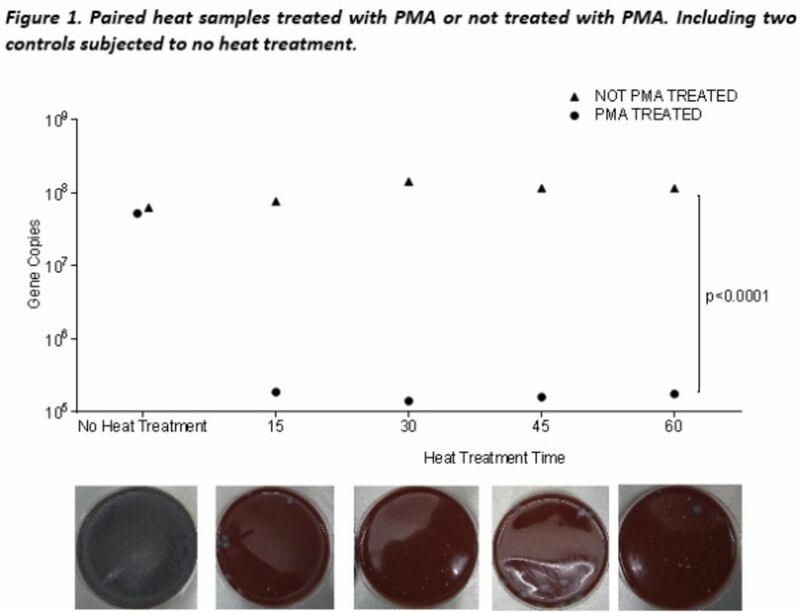 Samples treated by heat and stained with PMA had a significantly lower amount of H. influenzae detected than samples not treated with PMA (p<0.001). Conclusion: PMA appears able to distinguish between viable and non-viable H. influenzae, but further studies are warranted.